Exercise Atlasur XI between South Africa, Brazil and Uruguay will take place in August and September this year, the South African National Defence Force (SANDF) has announced. Atlasur XI usually also includes Argentina, but the country will not participate this year, SANDF Corporate Events stated. Atlasur XI will take place in South Africa, which is the lead nation, between 20 August and 24 September. Uruguay will be contributing the replenishment vessel ROU 4 General Artigas along with 140 crew and an embarked helicopter. This is a converted German Luneburg class replenishment oiler commissioned in 2005. It is not yet clear what South Africa and Brazil will be contributing. Atlasur is usually held every two years between South Africa, Argentina, Brazil and Uruguay. Previous iterations have focussed on seagoing operations, special forces tactics and air-sea operations. Atlasur originated in 1993 when the navies of the four countries created the opportunity for multilateral security co-operation in the South Atlantic Region. The 2010 event was hosted by Argentina and involved the South African submarine Charlotte Maxeke and the Combat Support Ship SAS Drakensburg deploying across the Atlantic to the Argentinean naval base of Mar el Plato. The 2012 edition was hosted by South Africa and saw participation from the SAS Amatola, submarine SAS Queen Modjadji I, the Maritime Reaction Squadron and SA Air Force as well as Argentine frigate ARA Espora, Brazilian corvette BNS Barroso and Uruguayan frigate ROU 1 uruguay. 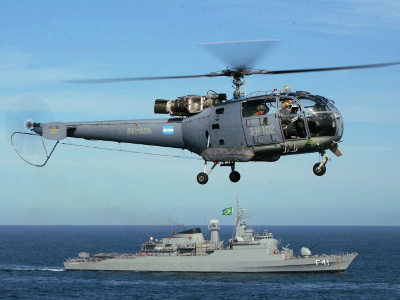 Atlasur X was held in Brazil in August and September 2014 and saw the participation of SAS Isandlwana, which according to the South African National Defence Force performed ‘brilliantly’ and “enhanced our good relations with the navies of Brazil, Argentina and Uruguay.” Six Brazilian vessels, one Argentine corvette and one Uruguayan frigate took part in this event. The other major naval exercise between South Africa and countries in the region is Ibsamar, between India, Brazil and South Africa. This also takes place every two years, as does Exercise Good Hope with the German Navy.